We carry over 1200 mouldings and can access within a week more through the catalogue of APM. 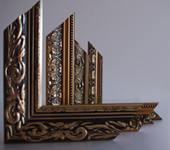 We offer a variety of price and styles to suit all types of framers- custom or contract. We have woods, gold and silver coated frames, coloured frames, ornates with gold or silver leaf, aluminium, and even synthetics. Styles vary from the small certificate frame to 10cm grand frames. 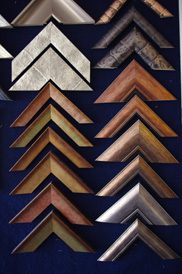 We are the only picture framing wholesaler in Western Australia to offer the full range of 2mm framing glass. Our clear float and non- reflective glass comes in different sizes – 920mm x 1220mm, 1220mm x 1525mm, 1525mm x 920mm. We also carry Tru-Vue – a 97% UV protected 2.5mm glass in 3 varying sizes. This is a worldwide recognised framing glass which also comes in a Museum standard. All of the glass is hand delivered to your premises in quantities of between 10 and 100 sheets of glass with 45 sheets being the standard delivery. We currently carry 4mm thick mirrors with a 25mm bevel in various different sizes which again are delivered to your premises. 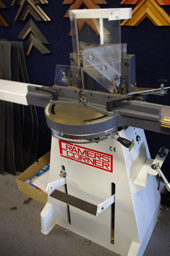 Underpinners, guillotines, mitre saws, matcutters – manual and computerised, staple guns, point drivers, tape dispensers, laminators, hot and cold presses, multi material cutters , - so many different machines are in the industry – and everyone has their own favourite. Therefore we stock a variety of different brands – Keencut, Cassese, Logan, and Framers Corner to name a few. Picture Framing is a very individualised creative business with all framers having their ‘own method’ to achieving the end result. We carry 3mm, 5mm, and 10mm adhesive and non adhesive acid free boards. We carry the Rupaco range which is a good quality, acid free American made board in approximately 120 colours in the size 32 “x 40” and approximately 80 of these also come in the size 40” x 60”. 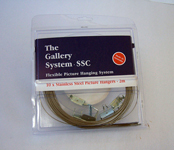 We are the agents for Gallery Systems in Western Australia. This is a Queensland based company with the product being devised and manufactured within Australia. It allows for multiple paintings or pictures to be hung from a track on the wall so that artwork can hang at different heights without the need for lots of holes to be drilled in the walls. The track is sold as a white or aluminium product with varying types of hooks including security hooks for hotels/restaurants. As per other products in the framing industry, every framer has his or her own preferred method of finishing the artwork.